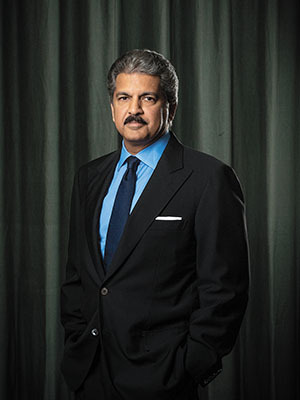 Anand Mahindra is Forbes India "Entrepreneur for the Year 2013"
Forbes India has been a champion of entrepreneurial capitalism, in line with the Forbes DNA defined almost a century ago in the US. We share the vision that over the next 10 years, India has a never-before chance to create an entrepreneurial renaissance. We believe in the spirit of fairplay: that entrepreneurs need to follow the rules. One way we seek out and recognise outstanding leaders who lead from the front every year is the Forbes India Leadership Awards. We have instituted the distinctive annual awards to recognise transformational leadership across the entrepreneurial firmament, from start-ups and mid-sized firms to the more mature organisations of global scale. The categories also reflect our magazine's charter. The 10 awards recognising outstanding CEOs and entrepreneurs and business leaders who have built enterprises that have had a deep and enduring impact on the wider society were presented at a function attended by the crème-de-la-crème of India Inc in Mumbai today. Our process for the Forbes India Leadership Awards 2013 started almost six months ago, with extensive research on qualitative and quantitative parameters. The long-list of nominees for each category was whittled down by June and we had a strong set of five nominees for each category. In July, our high-powered jury headed by Mr KV Kamath, the non-executive chairman of ICICI Bank, examined the nominations and came up with our set of winners. Adil Zainulbhai, Chairman-India of McKinsey & Co, Akhil Gupta, Chairman of Blackstone Advisors India, Ajit Rangnekar, Dean of the Indian School of Business, Zia Modi, Senior Partner, AZB Partners, and Raghav Bahl, Founder and Group Editor of Network18, bring years of experience in the corporate sector to our jury. KPMG, our knowledge partners for the event, helped with the number crunching so essential for the process. Congrats Dear Mr.Anand Mahindra sir , I feel very proud for being part of Mahindra Group . Congrats Mr. Mahindra for the award.